The Extra Life marathon seeks to prove that videogaming and pediatric care are a natural fit for each other. Ladies and gentlemen of the Escapist Community, today I'd like to take off my Escapist Newsie hat and ask you a question: If it were possible to save the lives of children around the world by doing nothing more than playing videogames all day, would you? If you are like me, you will have asked yourself this question many times, but today I am glad to inform you that the answer is finally within your grasp. That answer has taken the form of Extra Life, a 24-Hour Game Marathon held each October to raise funds for children's hospitals. Having personally participated in the event each year since its inception, I will be returning for its fifth season, and am looking for your help to make it the resounding success it deserves to be. Here's how it works: On Saturday, October 20th, from 8AM to 8AM, I will be be playing games. Videogames, board games, and roleplaying games are all on the table, and I'm hoping those reading this (especially you!) will sponsor my efforts via tax-deductible donations to Children's Miracle Network Hospitals. Speaking from personal experience, this is perhaps the most enjoyable way I've ever directly supported a charity, and it allows you to directly contribute to pediatric treatment and research worldwide. 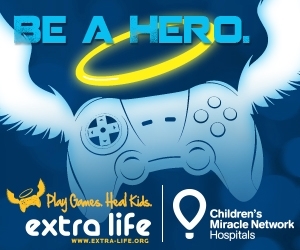 Extra Life was started in 2008 by Sarcastic Gamer as a way for the gaming community to directly support children's cancer research. The charity's partnership with Children's Miracle Network Hospitals now allows individual participants to earmark funds for specific hospitals in the US, UK, Canada, and Australia. Extra Life has successfully raised $2 million for children's hospitals, including $1.1 million in 2011 alone. That little detail was more than enough to convince me that an entire day of gaming could be time well-spent. If you'd be interested in supporting me, please stop by my sponsor page and make a donation. Any amount will be accepted, but since I've set a personal goal of $1000, contributions of at least $24 dollars ($1 per hour) would be awesome. Alternatively, if you think this opportunity is too incredible to pass up yourself, you can sign up for the event to enjoy a full day of gaming confident in the knowledge that your fundraising efforts will directly help kids around the world. So how about it, people? Let's show the world yet again what gamers can do. For more information, check out the Extra Life FAQ.